Warning: what you’re about to read, what I’m about to describe, what I ate for dinner at DB Bistro Moderne one night last week, was and still is even a week later, a little ridiculous. And by a little I actually mean really, really ridiculous. It was over the top, gluttonous, uber rich, and decadent in a way I never knew a burger could be. 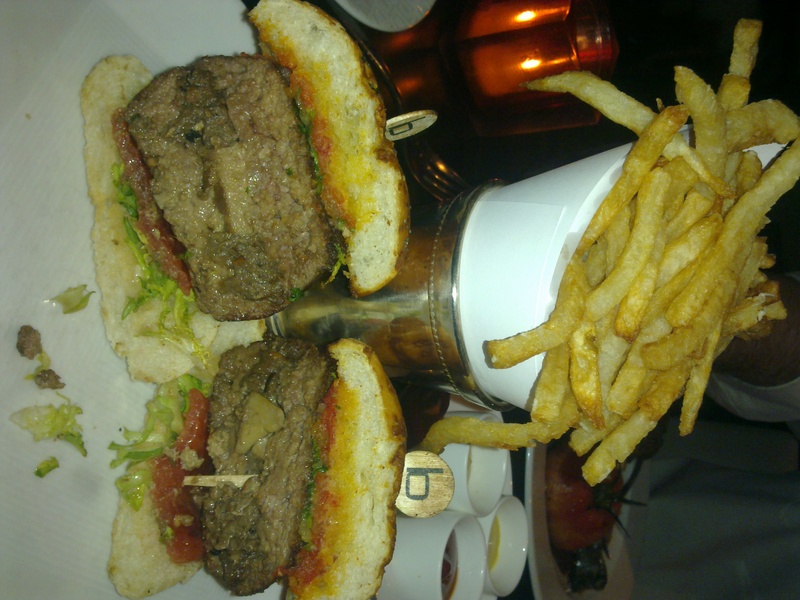 To celebrate the new job I started this week (note: I’m always looking for a reason to eat out and this one seemed pretty legit) the boy and I went out for dinner at DB Bistro, where I will openly admit I wanted to go only so I could order the ridiculous $32 Original DB Burger. What the hell’s in a $32 burger you ask? Brace yourself. In between doughy, soft parmesan buns was a fat sirloin burger stuffed with braised short ribs, foie gras and black truffle. That’s right. Short ribs, foie gras and truffles. Inside of a burger. How absurd is that? Pretty damn absurd. But you know what? It was delicious. Juicy, messy, almost obscene, but so good.